Love the color enhancing liner and gold toned inner edge. Really enhances the various colors of my painting! Great quality product! Love it! The linen liner brightens the frame and brings out the lighter areas of my painting. This was the best choice for a family wedding picture. It fits perfectly over our mantle. 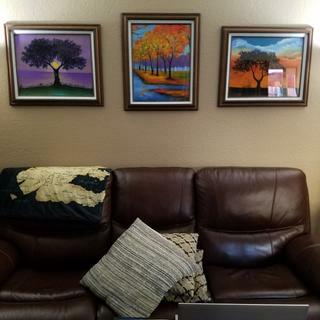 My pictures were a hit in these beautiful frames. Nice to get so many all the same. Easy to order, great service, beautiful frame for a very reasonable price. Perfect for my painting! Excellent purchase! They are well made and look very impressive! 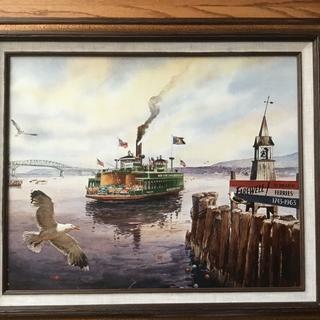 The frame is an excellent match with the artwork we produce and market to the Hudson Valley area of New York.The turn around time makes it very easy to order, get delivery and get finished product to our customers. Your company takes great care in the shipping of the product which is another reason for the high value of your product. I love this frame with my canvas oil painting. The colors on the frame are beautiful and really made my painting pop. Beautiful and classy looking. Packed well. Shipped quickly. Has true antique look. 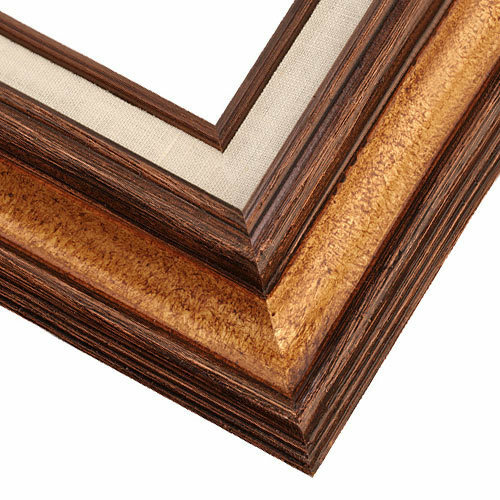 Ordered these rustic pre-built walnut and gold frames with linen liner to adorn our cruise-ship purchased art (rather than accept the outrageous quote from the gallery onboard.) The artist is David Najar. We think the frame's colors work well very with his use of bright and dark contrasts. The prints are on vellum with deckled edges which were barely visible. If I was to do it again, I would either make it slightly smaller or slightly larger to either hide or expose the edge completely. The company responded to my email inquiry too late for me to change my order. Very pleased with the speed and quality, however there was some damage from shipping which caused a dent and missing varnish on one of the frames. Be sure to upgrade the backing and poly to acid free and uv blocking. Too cheap not to. One had a dent and scratch to the varnish. Upgrade to acid free and uv blocking. This is a great gold frame! Love the style. Great value and very durable. I would definitely recommend this to a friend. First frame we received had a mark on the canvas that looked like a stain that was caused by a jig or something holding the frame. It took away from the photo in the frame. The replacement frame was worse - the canvas along the edge was glued poorly and in fact, for a few inches, it looked like a different piece of fabric (or maybe the cloth was stretched more in this area). Visually, it was very poor quality. So, we had to resort back to the first frame while we look for another alternative. I guess, we got the value that we paid for the frame. They replaced the first frame immediately, but the replacement showed it wasn't worth going through the process again. Hello Jeff. We really appreciate your valuable feedback. This is not the ordering experience we would have hoped for you. The orders are carefully inspected before leaving the building which leaves us unsure of how this could have happened (twice). We attempted to reach you by phone today and unfortunately we were not able to speak with you. We did however leave a voicemail informing you that we can send another replacement, or offer you compensation for keeping the frame. Please give me a call directly and let us know which option will work best for you. We want to make sure your satisfied with the order. The cost of the frame is economical and we also want to convey excellent quality as well. We hope to hear from you soon so that we can resolve this issue. Have a great day! I was looking for a frame for a seascape I have painted and felt this frame would be perfect. I liked the linen liner, because the photo won't be matted. Also, the gold accent goes well with the color scheme (sunset) of the picture. 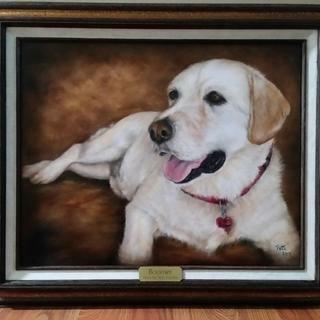 I recommended it to my customer because it complimented the portrait of her pet that I painted for her. She loved it and asked me to order it for her. Beautiful frame for the price! I am trying to compliment an existing frame with painting This looks good. Part of a series of 10 paintings. They present very well together, just the right size. Always happy with your frames. Been using them for my paintings for years. The depth, the coloration, the Style. I like it ! Great looking frame for a great value. Needed to frame antique map. The inner border of the frame will enhance the picture. my stretch canvas artwork to be framed is 18 inches wide, 24 inches tall and 3/4 inch deep will this frame work? BEST ANSWER: Yes, it sounds like this will do quite well and it makes a great show of your art. I use clip-it fasteners on all my artwork; they are easy to work with and should you find a buyer who likes a different frame, it is easy to make the switch from one frame to another. I really liked the frame, but cannot remember how deep it was. 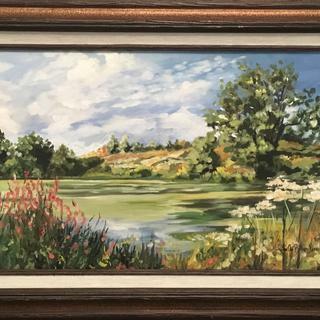 I sold the painting in this frame so it worked for me. I would buy again. Suggest you ask the vendor whether or not your painting will fit. I cannot comment further on that. You can use this frame, the canvas will extend from the back of the frame a bit. If you order the canvas clips this will allow you to secure your canvas into the frame. I purchased mine for a slightly smaller landscape and it looks great, the linen liner adds an elegant look. Quite satisfied. Yes...use appropriate clips to match canvas stretcher bar thickness. Picture frames mounting clips will not work. Do any of these frames come in large sizes for bigger canvas paintings about size 30" by 32"? BEST ANSWER: We do offer larger sizes in our frames. Our customer care team can find the perfect fit and frame for your canvas. They can be reached at 1-800-332-8884. Thank you and happy framing! My canvas is 16 (W)*20(H). Can this frame be fit/installed easily outside the canvas? BEST ANSWER: Hello! The frame comes in the size of 16"x20", however, the depth/rabbet of the frame is only 3/8". Please measure the thickness of the canvas and make sure the depth/rabbet of the frame is compatible. Happy Framing! My 16" x 20" Giclée has deckle edges varying its measurement between 15.75" - 16" x 19.5" - 20". What is the exact measurement of the opening? I can't decide if I want the edges showing or not, but I certainly don't want them partially exposed. BEST ANSWER: Thank you for reaching out to us Gino! As an industry standard, we add 1/8" allowance to the opening of the frame. If you are thinking of exposing the deckled edges, you may want to mount the artwork on a slightly larger piece of foam core. Perhaps using a mounting board 1/2" larger than the artwork would give you a nice hint of the deckled edge. Keep in mind that the lip of the frame is typically 1/4"-3/8" wide, therefore you would see 1/4" of space around the artwork. Please give us a call to place the order if you need assistance. Happy Framing!